Based on recent positive studies, dermatologists are recommending topical probiotics as a component of an effective skin care strategy to combat four skin conditions: acne, rosacea, eczema and aging skin. 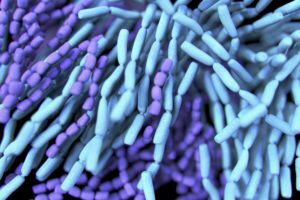 Researchers now are testing probiotics to determine which ones make the substances that can kill bad bacteria. The researchers predict that the strains could be identified in the very near future and will then be marketed in products for their antimicrobial properties. Another effect of topical probiotics is that they may help the skin build collagen, the main protein in skin that affects its texture and tone. Increased numbers of good bacteria may also help to hydrate aging skin, reduce sun damage and improve the appearance of fine lines and wrinkles. 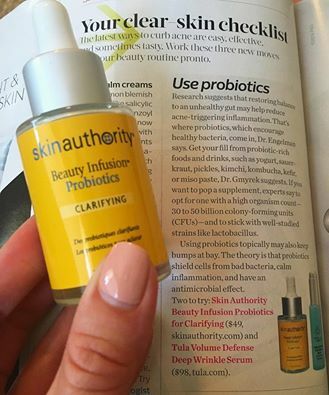 According to Shape Magazine (09-2016) “… probiotics shield cells from bad bacteria, calm inflammation, and have an antimicrobial effect … stick with well-studied strains like lactobacillus.” And also touted the Skin Authority Beauty Infusion™ Probiotics for Clarifying as a “MUST TRY” on their clear-skin checklist. Skin Authority Beauty Infusion™ Probiotics for Clarifying contains Lactobacillus Ferment, Lactococcus Ferment, Lemon Ferment, Leuconostoc Ferment, Pediococcus Ferment, Saccharomyces Ferment, in addition to the calming ingredient of shea butter. The infusion can be applied to the skin directly, or mixed with other skin care products or face makeup. For more details, or to experience a free skin coaching session, contact your skin coach at 866-325-7546 ext. 4, email at myskincoach@skinauthority.com or live chat at http://www.skinauthority.com. At only $49 for a 1 oz bottle, you may purchase at http://www.skinauthority.com/Probiotics-for-Clarifying or at one of our spa/retail locations. This entry was posted in Celeste's Corner, Healthy Lifestyle, Skin Care Essentials and tagged acne, anti-aging, eczema, probiotics, rosacea by Judy Voce. Bookmark the permalink.